1. To Cook Eggs-In a small pot, add eggs and cover with water. Bring to a boil, turn down to simmer and cook for 20 minutes. Drain water and place eggs in a bowl of ice water for 30 seconds. You want them to remain warm but not too hot to handle. Remove from water and peel eggs. 2. In a small bowl, using a cheese grater, shred 2 whole eggs and 2 egg whites. Throw away the other 2 yolks or use them in another recipe. Stir in mayonnaise, relish, mustard and a little salt and pepper, to taste. 3. Preheat oven to 400 degrees. 4. Lightly toast 1 bagel thin. 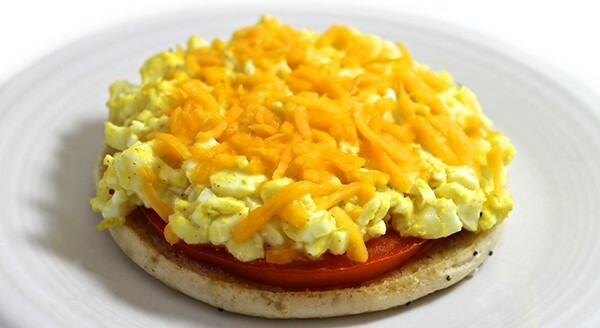 On top of each bagel thin lay 2 thin slices of tomato to each bagel half. Divide the egg salad mixture and place over the tomatoes. Sprinkle each with 1 tablespoon cheese. 5. Place on a baking sheet and bake in oven for about 5 minutes until cheese is melted. Or, heat in microwave until cheese is melted. 6. Plate each and serve at once.